I recently enjoyed an article by Kevin Laczkowski and colleagues at McKinsey titled “Seeing your way to better strategy”. It argued for four lenses to help you “see your way” forward – Financial, Market, Competitor and Operating Model. The thought behind these lenses is that, by doing some focused thinking around each lens, you will develop better strategy. I recently enjoyed an article by Kevin Laczkowski and colleagues at McKinsey titled “Seeing your way to better strategy“. It argued for four lenses to help you “see your way” forward – Financial, Market, Competitor and Operating Model. The thought behind these lenses is that, by doing some focused thinking around each lens, you will develop better strategy. While this is not the first of these kinds of articles (see David Collis’s “Can you say what your strategy is?”), it is the first one to include “operating model” as one of the perspectives. Unfortunately, in the article, the operating model perspective is allocated little more than a paragraph, and, in my opinion, says little of note. So, I thought I would improve on it. First let me summarize the other three lenses. The financial lens is about using financial analysis to understand if the strategy is ambitious enough: will it justify the current share price, will it deliver top quintile performance compared to peers, will it outperform the do-nothing-new option? Can we afford it? The market lens is about granular analysis of where growth and profits are now and will be in the future: which segments, which countries, which channels, which adjacencies? Is the strategy exploiting these trends with an appropriate balance between reliable profits and more risky opportunities? The competitor lens is about advantage. What gives advantage in each market and how well placed is our company? Will the strategy deliver improvements in our advantage? How much change will be needed for us to gain sustainable advantage in each of the markets we are targeting? The operating model lens is about implementation. Has the organization committed sufficient resources and capabilities given the strategy’s challenges? And also, is the organization designed in a way that will accommodate the new activities or new capabilities required by the strategy? So, let me explore this lens in a little more depth. For most companies, the current operating model acts as a constraint on strategy. New opportunities typically require new capabilities, which in turn depend on a new operating model. It is only once the new capabilities have been developed – the operating model has been transformed – is it possible to use the new capabilities to exploit the new opportunities. Often, the transformation is not achieved or not even planned and the operating model fails to deliver the new strategy. 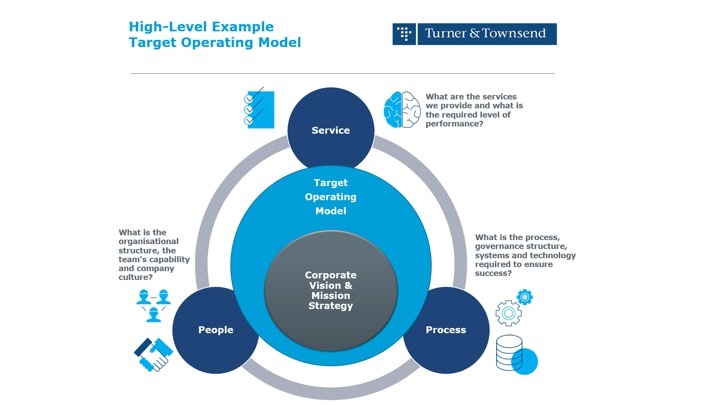 The operating model lens encourages strategists to think about the transformation that may be required, whether it is realistic and, if so, whether sufficient planning and resources have been or will be allocated. How does a strategist make this assessment? First, the strategist needs to understand the current operating model and the value propositions it is capable of delivering. The Operating Model Canvas is an excellent tool for doing this (see www.operatingmodelcanvas.com). The strategist can lay out, on one page, the current value propositions and the processes, people, information systems, locations, suppliers, management meetings and scorecards that enable the organisation to deliver these value propositions. If the strategy involves either delivering some new value propositions or delivering similar propositions to new market segments (as most strategies do), the strategist can assess how much transformation is needed: whether new processes, people, information systems, locations, supplier relationships, management meetings or scorecards will be needed and how much the existing ones will have to change. Using the Operating Model Canvas, the strategist can assess the size of the transformation required and the likelihood that the needed changes will be made successfully. If the likelihood of successful transformation is low, a wise strategist will want to reconsider the strategy or ensure that the leadership team have the commitment and the resources that will improve the odds. The operating model lens is asking whether the organization has or is likely to be able to put in place the people, structure, information capabilities, supplier relationships and management systems that will enable it to successfully implement the strategy? In my experience, successful strategies are not primarily about finding exciting new business opportunities. Successful strategies are about matching opportunities with capabilities, and ensuring that the result leads to an advantage over competitors. This means understanding the current operating model well, understanding what changes are realistic and understanding the competitor benchmark that must be exceeded. At the centre of the article is a “honeycomb” framework (see exhibit). So I thought I would try to link this framework with the Operating Model Canvas (see exhibit). Because the function is Procurement, the Supplier box in the Canvas becomes incorporated into the value chain: much of the value chain is about choosing suppliers, developing contracts with suppliers and managing relationships. This leaves three issues for discussion. The “Processes” element of the McKinsey framework is one of these. 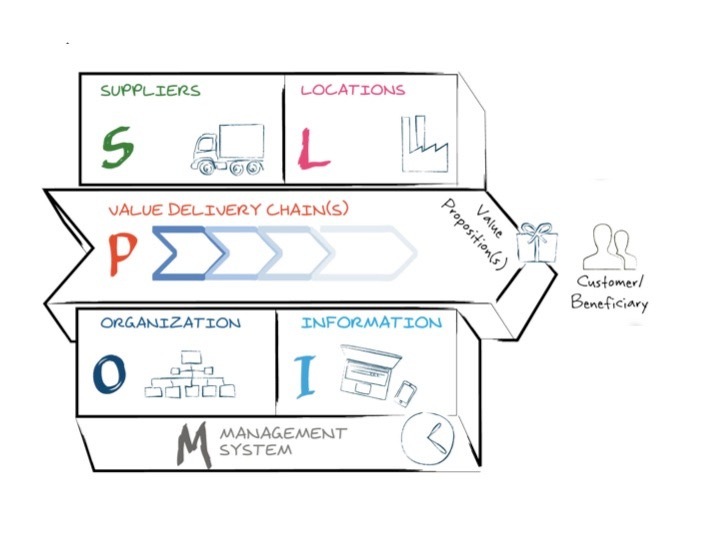 The article explains “In a next-generation operating model, processes are not only harmonized across business units and geographical regions but also employ category-specific solutions that streamline approval processes for the user journeys associated with a particular channel and category.” In other words, McKinsey’s “Processes” element appears to be about “value chain mapping” drawing value chains for each category. This tool helps organization designers decide what parts of the value chain should report to categories, and hence potentially be different for different categories, and what parts should report to central functions within Procurement. For example, the first step – “procurement strategy” – could report centrally and the last step – “manage supplier relationships” – could report to the category managers. “Invoice to Pay” would typically report centrally, but there might be category specific elements in the process. “Manage categories” would report to the category manager, and might be very different for different categories. The second issue concerns the Locations box in the Canvas. It does not seem to be represented in the McKinsey framework. This is surprising. Location of staff is an important issue in designing the operating model of the procurement function. It is important to decide which staff should be located near suppliers, which staff located near other internal functions and which staff need to be collocated to smooth collaboration within the function. The third issue concerns “Digital” in the McKinsey framework. As the article states, “Advanced procurement organizations are increasingly making use of automation technologies to eliminate unnecessary manual work from transactional processes. Digital approaches can also enhance user experiences by making access to procurement services easier and more intuitive.” Does the Operating Model Canvas need another box for Digital? My answer is no, for the same reason that the Operating Model Canvas did not include a box for technology. The middle arrow in the Canvas is about the work steps and the machinery and technology needed to execute these work steps. The Information box is about the information systems needed to support these work steps (and the management system). Digitization is muddying this distinction. Digitization means that a number of work steps will be done by computers. The temptation is then to see these steps as being part of the Information box rather than the middle arrow. The same confusion is happening inside organizations wrestling with whether digitization should be led by the IT function or by a separate team. What is important is that all operating model designers recognize that there are two very different tasks – digitizing the work steps and providing information systems. Because some of the skills sets are similar and the need for collaboration between the two tasks is high, many have chosen to have both tasks led by the IT function. So where have we got to? First, McKinsey’s honeycomb framework is very similar to the Operating Model Canvas, although it may overlook the locations issue. Second, while the article claims to describe “A next generation operating model” for Procurement, in fact it just raises some issues that operating model designers should consider when designing future operating models. It provides a value chain and makes some interesting observations about what activities in the value chain will need to change in the future and how priorities might be redistributed. It emphasizes the influence digital will have on these value chains and suggests that “category specific” value chains may also be part of the future. But the article does not provide an organization structure or suggest what sort of information support is needed or how to resolve the locations issues or how to define those suppliers that need to be managed through collaborative agreements or what type of management calendar or scorecard is suitable for running the next generation procurement function. If McKinsey was using the Operating Model Canvas as its framework for operating model work, all of the above questions would have been top of mind and the authors might have more fully delivered on the article’s promise. Third, the honeycomb framework attempts to address the issue of value creation, distinguising between “enabling”, “capturing” and “sustaining”. I have been wrestling with how to link value to operating models for my course Designing Operating Models. It is easy when working on an operating model for a business because revenues can be offset against costs, and , as with lean analysis, “waste” or “lack of value” is any cost that does not deliver more than its weight in “value”. However, retaining a focus on “value” when doing an operating model for a function like Procurement is harder. McKinsey’s ideas have got me thinking … which will hopefully lead to a future blog. Agile team members are allocated to the agile team full time. Many cross-functional project teams are part time. Of course, many, like the Boeing example, are also full time (at least for a number of years). Just to confuse us all, some people call teams with part-time members “agile” teams. Agile requires a fully defined mission for the team. It also gives freedom for the team to “self-manage” in delivering the mission. Project teams will typically have objectives, but often not as much care is taken in defining the mission of the team, and less commitment is given to ensuring the team has freedom to work in whatever way they like. Agile typically requires co-location of the team. Cross-functional, project-team members often remain located in their function but come together for joint activities. Co-location is believed to be an important part of agile because it produces better communication (essential to self-management), more commitment and more speed. Agile typically involves using many of the methods of ‘scrum’, like backlogs, sprints, stand up meetings, visible progress displays, etc. Project teams, at least historically, involved few standard ways of working, and project management typically uses a “waterfall” approach. An agile team needs a “product owner”, the person in the team who prioritizes the backlog and does other “team-leader like” roles. A cross-functional project team has a team leader, whose role is typically broader and less well defined. An agile team is expected to produce intermediate outputs and trial these outputs with the beneficiary/customer it is serving. The concept of “minimum viable product”, from Lean Start Up thinking is important here. Agile teams are expected to generate trial outputs quickly and expose them for comment and reaction. Project teams, more typically work in a “waterfall” approach, only exposing their output towards the end of their work. An agile team is a permanent part of the organization. Whereas a cross-functional project team is typically expected to have a limited life, often months not years. However, many people use “agile” to refer to temporary teams, and because organizations change fairly frequently few agile teams stay the same for more than a year or two. Organisations with many agile teams (such as Spotify), typically call these teams “squads” and group them into “tribes” to help manage coordination between “squads”. The functions are called “chapters”. Organisations with many project teams may have a “project office” to coordinate “multiple workstreams”, as, for example, in post-merger integration projects. In summary, some cross-functional project teams (those with long time horizons, well defined missions, clear team member roles, scrum working practices, sensitivity to their customers, etc) are very similar to agile teams. But the typical cross-functional project team has important differences from the strictly applied agile team. This raises the question of what is the same between agile teams and cross-functional project teams. Both types of team have members drawn from different functional disciplines, and the functional disciplines are still responsible for the capabilities of their people. This is the matrix element. Both types of team have defined objectives and are expected to deliver within set time frames. Both are ways of breaking down the functional silos that stultify organisations. But “agile” is also associated with speed, customer-orientation and higher levels of motivation and engagement. I am always interested in the frameworks used by consultancies because they are working regularly with clients, and, hence, should be learning the most about how to do operating model work. So I eagerly read a BCG article by Miquel Carrasco, Kyle Peters and Peter Geluk on agile operating models for government. My immediate interest was to compare it with the Operating Model Canvas to see if I could learn anything. First, there are a good many overlaps. “Processes” is the same although the visual in their processes box does not look much like a process. “Structure”, “Culture and behaviour” and “Leadership and talent” overlap with “Organisation” in the Canvas. Although the emphasis on leadership is interesting. “Technological enablers” covers the same ground as “Information” in the OMC. “Measurement framework” is similar to “Scorecard”. 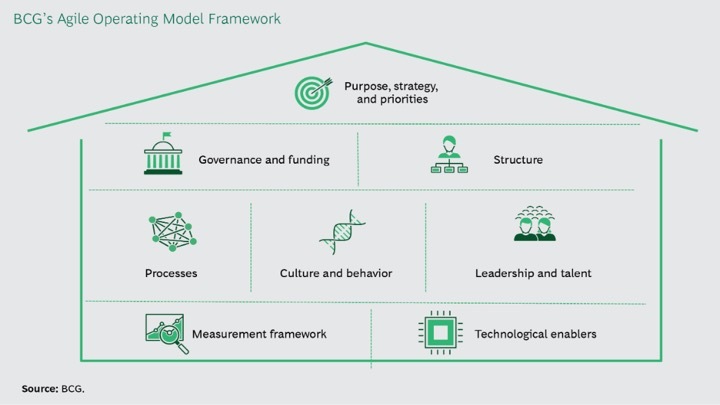 The final box in the BCG framework is “Purpose, strategy and priorities”. This has some connection to the “Value Proposition” and “Customer” parts of the Canvas. What is interesting is that “Location” and “Suppliers” are not part of the BCG framework. Given that one of the core ideas in agile working is the bringing together of cross functional capability into a single location so that they can work closely together, the absence of location in an agile framework feels like an omission. Furthermore, since agile is about moving fast, government departments are likely to need to work with suppliers who are more used to reacting in a few days rather than a few months. So some attention to Suppliers would also seem important to designing an agile approach. As is normal, when comparing frameworks, there is something to learn and something to teach. BCG’s attention to leadership is worth thinking about. As the authors point out, in an agile environment, leaders need to be good at articulating purpose and constraints, assembling teams and then giving teams the freedom to act. Not a natural style in government. But one that is well articulated by Stephen Bungay in The Art of Action. More broadly almost every new operating model requires changes in leadership behavior. So maybe the “Organisation” box in the Operating Model Canvas, should include special attention on the leadership behaviors needed to make the new model work. Some of this is captured in “Management Calendar”, but more thought about leadership behavior is probably warranted. BCG’s focus on funding is also worth attention. In a commercial organization the funding issue is part of the business model, and hence excluded from the operating model thinking. But in government, the distinction between business model and operating model is less useful. Hence it may make more sense to blend the two as BCG appears to do. On the teaching side, BCG might benefit from adding location and suppliers to their framework. They also lack any concept of customer or beneficiary in their framework. No doubt this is included in their “Purpose, strategy and priorities” space, but, even in government, it is important to keep a focus on who the beneficiary is.